Your hosts for these stories, Julie & Lee, couldn't be further apart in their historical connection to foods... Julie, a devout foodie from way back, Lee brought up on frozen foods and Oscar Meyer products. So, it couldn't be more surprising when Lee's reaction to visiting the Hawthorne Street location of New Seasons Market was: "Hey, I would consider moving to Portland just to be near this store." So what sets the New Seasons Markets apart? Their core philosophy -- a connection to place. This is apparent in many ways: commitment to the region, commitment to growers and suppliers, commitment to the community, commitment to each store's neighborhood and commitment to staff... locavore on a comprehensive scale. In the broadest sense, their goal is to strengthen the regional food economy by working with growers in Oregon and Washington. According to Lisa Sedlar, CEO, the average Oregon farmer is now 60 years old and the regional farm business will be changing hands over the next decade. By providing an outlet for their products, the Markets are helping to preserve agricultural land for the next generation. "It's not the most efficient distribution process dealing with literally hundreds of local vendors everyday," Lisa notes, "but it's part of our mission. While we negotiate price discounts with larger vendors, we don't with our smaller, local producers to help ensure their economic viability." The connection to regional producers is displayed to their customers in placards hanging throughout the store, bringing the farmer to the city in poetry and images. Local products on the shelves are labeled "home grown" and include their story. Local labeling is a way of "letting the people decide" what to bring to their tables and increasing awareness of regional agriculture. "Developing your local food economy is not an elitist idea. Connecting with how and where your food is grown is a time-honored way of eating," Lisa continues. "People are hungry for this connectivity because the world around us is so impersonal." Impersonal was last thing evident as the morning buzz played out in the aisles. The fresh-baked breakfast pastries joined latte's at the counter stools, early lunch-ers parked on the sidewalk tables to text and eat, skateboarders flipped up their boards to cop a quick snack. "One third of our customers come to the Hawthorne store by foot or bike," Lisa observed...a testimony to its "neighborhood" orientation. Dense on purpose with a "New York style urban tightness," each store reflects its locale. The Hawthorne Street store is "shoehorned into the neighborhood" through the demolition and reconstruction of an existing building, reusing 90 percent of the original building materials. Each store also participates in community outreach. Ten percent of after tax profits are given back to Portland causes and stores select neighborhood benefactors. Employees receive eight paid hours/year for volunteer work to the non-profit of their choice. Unlike many smaller grocery stores, they welcome food stamps: "Healthy food is for everyone," Lisa explains over her shoulder while advising a customer on the latest fresh caught tuna choices. Shad and Samtastic in the meat department embody this old-school approach to grocery retailing...in their case, the corner butcher who knows his meats, his cuts, his customers, all sourced locally. 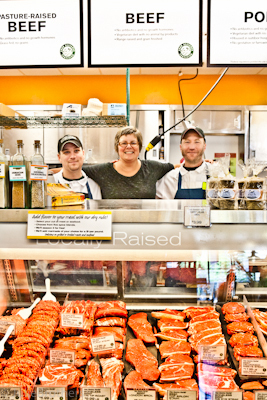 From behind the meat counter, Lisa notes the importance of staff members being connected to what they do. NSM's family owned structure and lean corporate approach allows stores to have a higher percentage of knowledgeable staff available to customers. As per Lisa, a typical chain grocery store has 7 percent-10 percent of its labor force in the store and 30% corporately. At NSM, 17 percent are in the store and only 3.4 percent in the corporate structure. Other unique locavore programs: vendor appreciation dinners where growers tell their family farm stories, food fairs bringing buyers and producers together to showcase new products, support for Portland Community College's Food Innovation Center and connections to "micro-local" food artisans producing specialty products from each neighborhood. 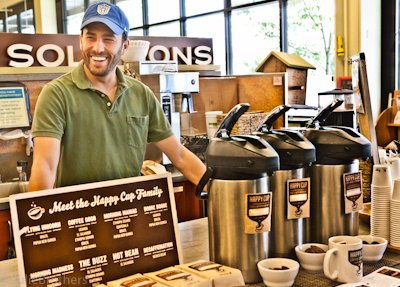 Featured in the store today, samplings of Happy Cup, "Coffee Roasted By People With Potential," a specialty shop that offers employment to local adults with disabilities and donates profits to vocational and recreational community programs. Lisa has been with New Seasons for 8 years, coming from a comprehensive connection to food and the fresh food supply chain. A chef who worked with Julia Child in culinary school and with Chef Jimmy Schmidt, she has also worked for Fresh Fields and Whole Foods. 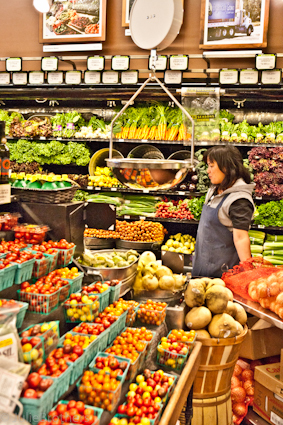 Lisa credits John Mackey of Whole Foods for "...a decentralized vision of grocery retailing, while others were focused on centralization," andStan Amy, who pioneered the chain organic store movement, with inspiring the Market's direction. Key to their business success... carrying national brands at competitive prices, as well as regional and micro-local specialty products. "We're not the food police. Our product selection is a result of people voting with their dollars." For Julie and Lee though, it was local all the way. Julie was consumed by the handcrafted sausages and farmstead cheeses such as Black Sheep Creamery Tomme and River's Edge Chevre. Lee couldn't get past the Mt. 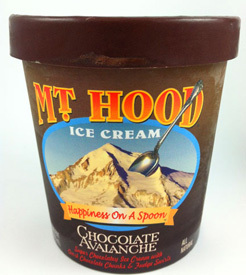 Hood Chocolate Avalanche ice cream. In Lisa's view, Portland is "...the best of several worlds: a strong creative class, a get-the-work-done mentality and a strong sense of community. We have created a business culture where we take care of each other and we take care of our customers." ... the friendliest grocery in town.